Tonight, as I shut down the house for the evening, Skeedles scrambled up on the deck. She rubbed and danced, but was hesitant to give up the crisp night for the confines of domesticity. I understand, it is the Hunter’s Moon. I have known a few hunters. Not the Elmer Fudds or jack-asses who give hunting a bad name. I have known women and men who viewed hunting in another light. My first fiancé was a mild and kind boy. We were high school sweethearts, the halcyon days of youth. He was a duck hunter in the marshes of Newbury. Once he realized the ducks tasted awful, he took to hunting without killing, just navigating his canoe through the channels watching the birds. I loved accompanying him; drifting and flushing the birds. We carried guns, he went so far as to buy me a beautiful light weapon and a license to hunt. We took no ammunition but our senses. Another woman and her husband I was privileged to accompany into the woods, hunted for food. They fed their family with the venison, wild boar and turkeys brought down by guns. There was a lot of sitting and waiting, and waiting and sitting. The cartoon image of Bambi and the cruel marksmen is nothing I ever witnessed. Every part of the animal was used and appreciated. This is not a defense of hunting, nor a consent. I live where animals hunt each other. One day on the way to work I watched a pack of coyotes take down a deer in a hay-field. It was gruesome, not quick like a bullet to the heart. Cats disappear regularly in this neighborhood and are featured on “Missing” posters tacked to telephone poles. I highly doubt they merely moved on. Bears patrol and one was spotted crossing the road the other night by a neighbor. They don’t necessarily pose a threat to pets but farm animals have fallen prey. The number of birds, moles, chipmunks and squirrels I have been honored to receive from my cat is well documented. I’m not sure where Skeedles fits in that spectrum of hunters. 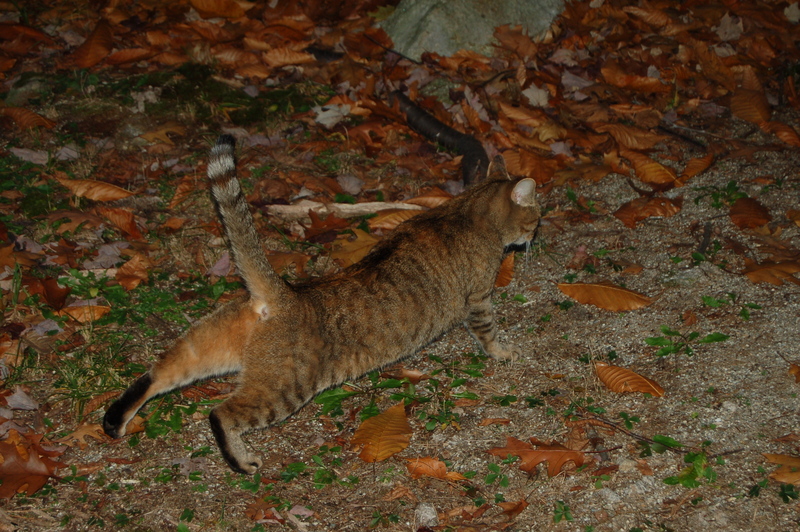 With a swish of her tail, she said “good-night” and leapt off the deck, darting into the shadows to hunt. This entry was posted in memoir. Tagged hunting, hunting in NH, inspiration, life in New Hampshire, memoir, wildlife. Next Post Next post: Where does creativity come from? Love watching the natural world. Thank you Susan. Though it isn’t always pretty, it is life at it’s most raw. Hunting with a camera might be fun! My choice of weapon, Allen!! We banned fox hunting in England a few years back and I think I was pleased. It seemed wrong to dress up and ride through the country chasing a poor fox for sport. Now they lay a trail and the dogs and horses follow that. Hunting for food though, to survive, is a different matter. Personally I’d rather just hunt with my eyes. Agreed! Hunting with a camera/eye is most rewarding, Marie. We used to fox hunt but the hounds were scent hounds so nothing ever died. Mostly saw coyotes. The only sad part about England banning hunting was the demise of all the wonderful kennels of hounds.